We've heard of candles being used to remedy split ends before, but have never seen this crazy cut. In this video posted on Youtube by user Earthling, a barber seems to be putting some kind of flammable powder on a customer's hair and setting it completely on fire with a lighter. He then uses two combs to style, while pieces of burnt hair fall to the floor. Ramadan Edwan, a Palestinian barber, uses fire in a hair-straightening technique with a client at his salon in the Rafah refugee camp, in the southern Gaza Strip on February 1, 2017. A Palestinian barber uses fire to straighten the hair of a customer in Rafah in the southern Gaza Strip February 1, 2017. A client sits in a hair salon after barber Ramadan Edwan performed a technique that utilizes fire to straighten his hair, in the Rafah refugee camp, in the southern Gaza Strip on February 1, 2017. 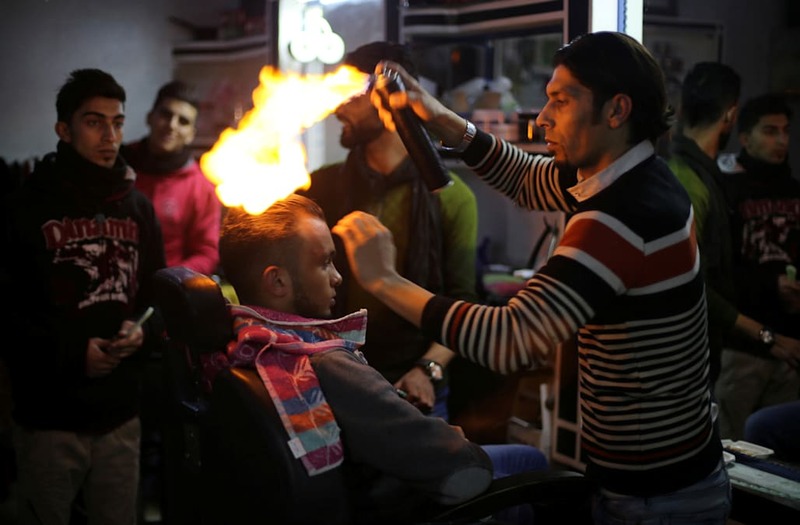 A client sits in a hair salon as barber Ramadan Edwan performs a technique that utilizes fire to straighten his hair, in the Rafah refugee camp, in the southern Gaza Strip on February 1, 2017. A client poses for a photo in a hair salon after undergoing a hair-straightening technique that uses fire, in the Rafah refugee camp, in the southern Gaza Strip on February 1, 2017. And the customer is just chillin' with his hair on fire. Not panicking. Not screaming. Not finding the nearest sink. Apparently, this technique is used to prevent fallout and keeps hair looking full and healthy. But scissors, though sharp, still give great, less horrifying haircuts if you're not into all the flames.